Since independence Egypt has had a volatile history, which included a period where ties with the Soviet Union grew stronger. It also however coincided with a time when you had to be brave to fly the national airline at all and the number of aircraft, both Soviet and Western that it crashed was quite staggering. Here I take a look at how Soviet types fared flying from Cairo. In June 1956 Egypt gained a new President, Gamal Abdel Nasser and his independent pan-Arabic and anti-imperialist policies led to a rift with the West further expanded by the Suez Crisis in 1956. On the flipside the exact same policies endeared him to the Soviet Union who vaguely shared some of his more socialist policies and were of course always pleased to see someone sticking it to the US and UK. In fact, Nasser’s Egypt (which briefly joined with Syria to form a United Arab Republic from 1958-1961) gained significant aid and assistance from the Soviets. They went as far as decorating Nasser with the Soviet Union’s highest honour, the Hero of the Soviet Union with the Order of Lenin, during Khruschev’s visit to Egypt in 1964. All timetable images are courtesy of the excellent Timetablesimages.com which I can highly recommend. 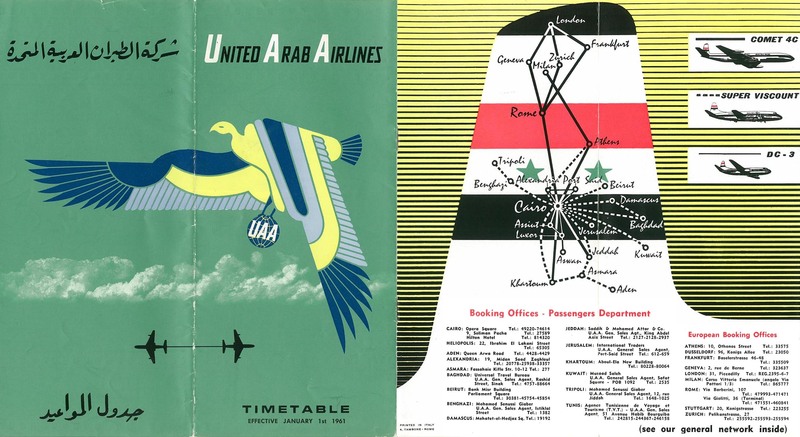 Given these new ties and the number of Egyptians being trained in the USSR it was only a matter of time until Soviet aircraft found their way into the fleet of the national airline, which despite the dissolution of the union with Syria was still known as United Arab Airlines. The UAA fleet rather surprisingly continued to have a rather British tone well into the 1960s with Vickers Vikings followed by Viscounts and even De Havilland Comet 4s. The fleet was bolstered in the early 1960s by secondhand DC-6s but a deal for new Boeing 707s fell through during 1961. The first Soviet equipment to enter service were Antonov 24s with 10 B variants, worth $2.3 million, delivered from 1965. These were detailed to assist the DC-6s in replacing the Viscounts on domestic services and indeed on August 1, 1965 a domestic subsidiary called Misrair was setup to operate the Antonovs and DC-6s. This only lasted until January 1, 1968 when it was folded back into the parent company after suffering losses both financial and actual. UAA’s safety record during the 1960s and 70s was appalling. A Viscount was lost in 1960. In 1962 there were two crashes (a DC-3 and Comet 4) and again in 1963 a further aircraft of each type was lost! To add to this in September 1963 another Comet was damaged. Then in 1967 a further Comet was destroyed, this time on June 22 at Kuwait City. These were however just the losses of Western aircraft that decade. In fact, of the 10 AN-24Bs 7 didn't survive their experience with UAA! Three aircraft were crashed within the first year (SU-AOA/AOB and AOM), another was written off in 1968 (SU-AOL) whilst three hardy survivors made it to 1970 only for all three to be destroyed in the same year (SU-AOC/AOK and ANZ). Unsurprisingly UAA found itself in need of further aircraft and looked towards both East and West. Boeing 707s were finally ordered and arrived in 1968 but so too did a more unusual choice – the big Russian turboprop Ilyushin IL-18. The Il-18s were destined for European routes, especially those to Eastern Europe. The first pair (of an eventual four) arrived in August but true to form within 6 months UAA had crashed one. The IL-18D, SU-APC, undershot the runway at Aswan in poor visibility on March 20, 1969 killing at least 93 of those onboard. Meanwhile UAA continued to crash its remaining Comets. Two were destroyed in accidents in 1970 and another in January 1971. This meant that of the 9 Comet 4Cs operated by UAA no less than 5 of them were destroyed in accidents. Once again UAA was searching for new jets and this time Russian influence (and probably difficulty in getting funding) convinced them to order the long haul Ilyushin IL-62. The order was announced on May 23, 1971 for a pair to arrive in June with a third leased by the end of the summer. The Egyptians had apparently been keen to acquire TU-134s, which would have probably suited the hotchpotch fleet better. At the time it consisted of 4 707s, 3 IL-18s, 3 newer AN-24s, 4 Comet 4Cs and a pair of grounded DC-6s. The Il-62s found themselves used on prestige routes to Europe and from July 9 on Asian services as well. 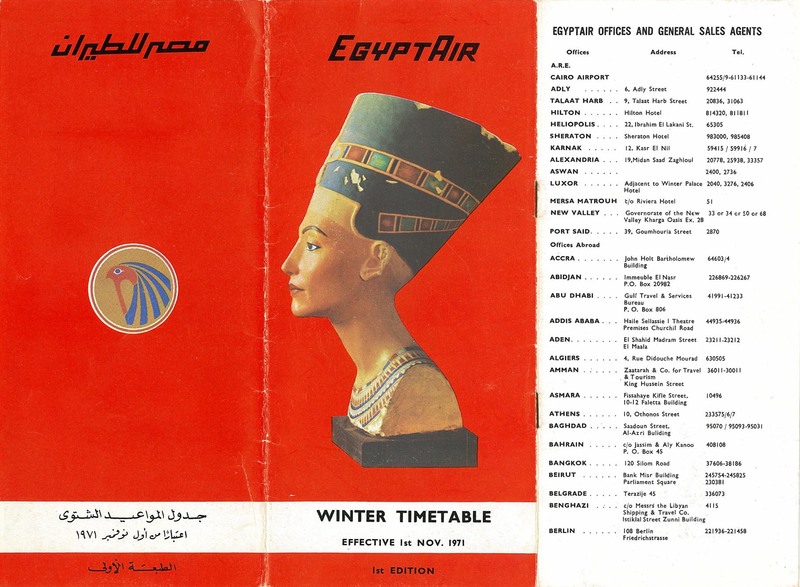 Mercifully on October 1971 UAA’s no doubt tarnished name was changed to Egyptair. By this time Nasser was dead and had been succeeded by Anwar Sadat who adopted a more liberal set of policies and attempted to distance himself from the Soviets. This hadn’t had time to reflect itself in Egyptair’s equipment plans by July 1972 however when the airline ordered 8 Tupolev TU-154s for $60 million. Nonetheless the carrier also ordered more Boeing 707s and on October 15, 1973 returned the IL-62s to the Soviet Union. Unfortunately, the name change had hardly made a dent in the carrier’s propensity to crash aircraft and one of the IL-62s was damaged beyond repair in June 1972 during a landing accident. Worse in December 1972 one of the 707s was crashed during a training flight. That year, not content with crashing its own aircraft, a leased Inex Adria DC-9-32 was also destroyed (YU-AHR crashing on approach to Aden in March). The new year opened with yet another crash when on January 29, 1973 an IL-18 (SU-AOY) flew into mountainous terrain near Nicosia killing all 37 aboard. At least new 707s were being delivered and in October the first TU-154 finally arrived as well. With the TU-154s arriving the surviving Il-18s were to be returned to Russia. At the end of the year the fleet stood at 8 707s, 4 Comet 4Cs, 3 IL-18s, 3 AN-24Bs and the bulk of the TU-154 order. The TU-154s ferried through Heathrow on delivery where they were fitted with British seats. Unfortunately, as with so many aircraft in Egyptair service their careers were not happy ones. It only took until July 10 for one of the trijets (SU-AXB) to crash, as with so many others this was on a training flight. By this time relations with the Soviets had cooled dramatically and this no doubt gave the Egyptians the chance to try and get out of their deal for the TU-154s altogether. Egyptair requested that it be allowed to return the aircraft and get a full refund too. An agreement was made in February 1975 and the TU-154s were returned soon afterwards in March. At around the same time the remaining Antonov 24s were traded back to Aviaexport, the company representing the Soviets, as partial repayment of loans taken out for the TU-154s. So, ended the influence of Soviet aircraft in the fleet. Replacement aircraft were leased in at first and finally after initially ordering DC-9-50s a fleet of Boeing 737-200s arrived. Soviet aircraft were renowned for their sturdiness but even they were not capable of surviving the beating that the Egyptians were giving out and in hindsight it is hard to attribute a lot of blame to the aircraft. 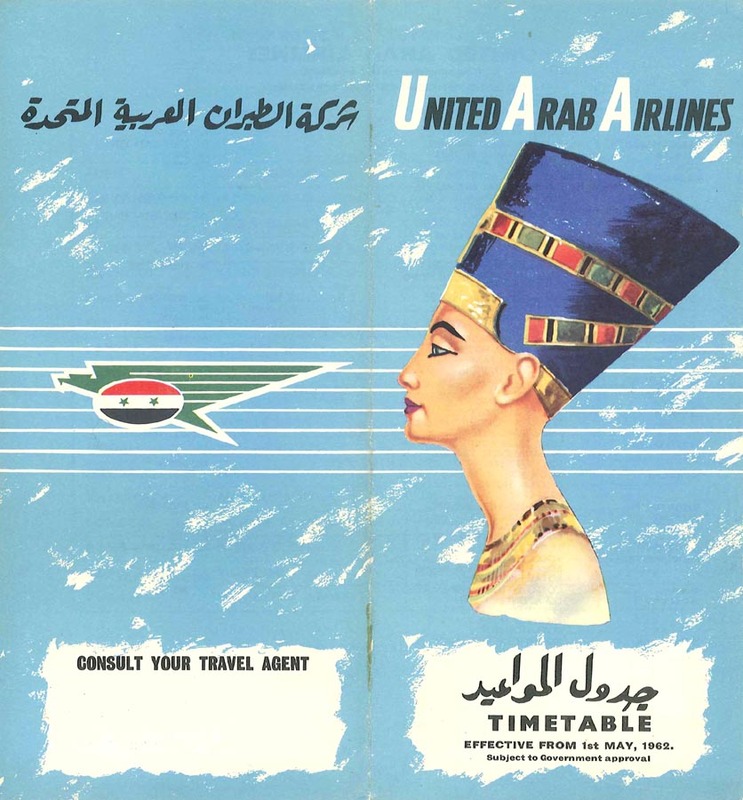 Certainly, you’d need to have been brave to fly on UAA during the 1960s or Egyptair during the early 1970s! That is 28 aircraft of a total of 74 operated, or 38% of the fleet! Plus another 707 was lost in 1976. Oh what a wonderful piece of airline nostalgia you have put together. How I would love all those retro types from Aeroclassics in United Arab Airlines colours - Viscount, Comet and, IL-18 to accompany my lovely, but lonely, 707 in this gorgeous scheme.